Saraswati Day is a day devoted to the Goddess Saraswati. She is the goddess of knowledge, creative arts, wisdom, language, learning and purity. Balinese believes this as a celebration of the descent of holy knowledge to mankind for prosperity, progress, and peace. Goddess Saraswati. Bali, 2017. Acrylic on Paper, 19 x 19 cm. She is depicted as a beautiful woman, four-armed and each holding sacred items. 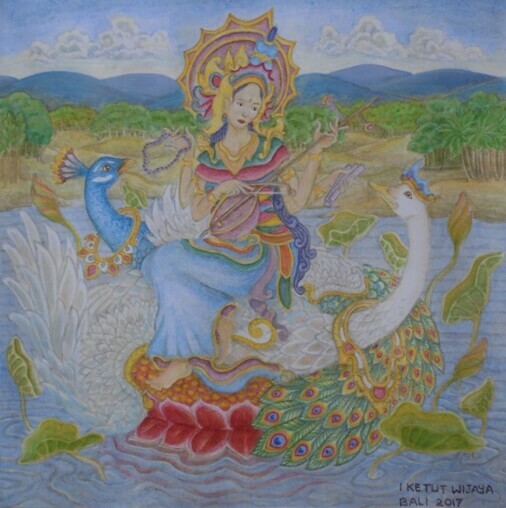 The Goddess is holding Veena in the middle of a pond, which is full of lotus flowers along with the sacred birds (swan and peacock). So the Goddess Saraswati day is devoted to Ida Sang Hyang Widi Wasa in the manifestation of Goddess Saraswati, for the grace of holy knowledge so that human beings can be freed from avidya (foolishness) to everlasting peace and perfect soul (essence of one self). The Saraswati day in Bali is celebrated every 210 days (six moth in Balinese Calendar) on Saturday or Saniscara Umanis Watugunung. In this day all the scriptures, lontar, books and stationery are arranged in such a way, complete with offerings. This is an important day for Balinese, especially for teachers, devotees in education, as well as students. The next day, Balinese celebrates Banyu Pinaruh, a day of purification or cleansing. Early in the morning Balinese will go to the beach, lake, river or waterfall to pray and rinse themselves in the water.